February has been wet! According to the Capital Weather Gang, over 4 inches of rain has fallen in February, more this month than during all of November, December and January combined. Enough to catapult DC out of the drought – and close Rosedale for weeks. We are going to reopen Rosedale today, but several areas of the park still have standing water and saturated grounds. The driest part of Rosedale is the eastern lawn closest to 34th Place. 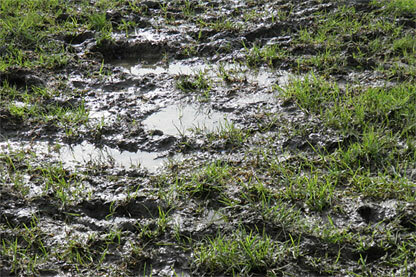 If you see soggy muddy spots, especially the slopes facing Newark, please move to a different area. A reminder to stay away from the fences. Don’t let your dogs and kiddos climb on, crash in to, or otherwise destroy them. These fences are crazy expensive to erect (and repair! ), but they are crucial to protecting and restoring the heavy-traffic areas of the lawn. We need them to last for several months. Thank you. If you have suggestions, please let us know at info@rosedaleconservancy.org.